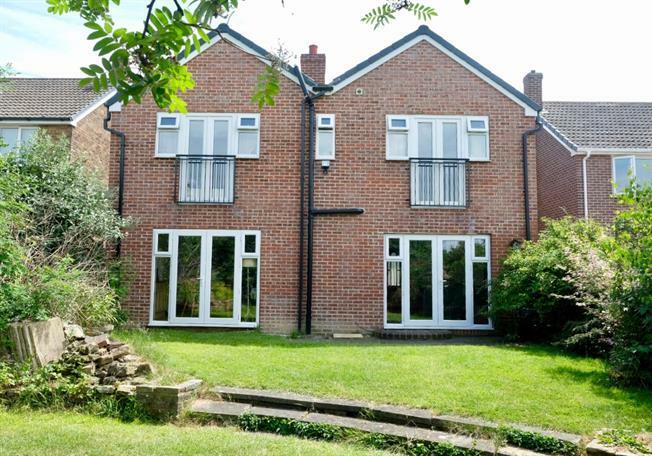 5 Bedroom Detached House For Sale in Wakefield for Offers Over £375,000. Perfectly positioned to enjoy stunning views to the rear towards Sandal Castle, yet still benefitting from being within close proximity to popular commuter routes and highly regarded schooling. This home has been extended and improved over recent years, now offering spacious accommodation with five double bedrooms (with potential to create a sixth in the attic, subject to the relevant consents), two ensuites and a family bathroom, in addition to an open plan sociable living area to the ground floor in addition to two well-proportioned reception rooms, plus dining kitchen and W.C. Externally the property offers driveway parking, integral garage, and enclosed rear garden ideal for family use. The entrance hall is accessed via the porch and features a spindle staircase running along one side with a useful cupboard beneath. The entrance hall provides access to the three key reception areas, W.C. And garage. The living room is well proportioned with a large window spanning almost the full width of the room looking out to the front elevation, in addition to windowed double doors which open into the dining area to create one large open plan space if desired. The dining area flows open plan to the adjoining family room, creating one sociable space - ideal for family living. The area offers plenty of space to accommodate a large dining table to seat eight or more guests. The family room features an impressive exposed brick through-fireplace with substantial Yorkshire Stone hearth and solid oak mantle. Ideal for installation of wood burning stove. French doors open out onto the rear garden with a window either side, flooding the room with natural light. Displaying exposed brick through-fireplace with solid oak mantle. The kitchen also has the advantage of French doors out onto the rear garden, in addition to a side external door. The kitchen is fitted with shaker style cream units with solid pine doors. Solid oak central island with butler style sink inset. Solid oak work surfaces throughout and wood flooring underfoot. A usefully positioned wash closet fitted with a hand wash basin and W.C.
A single garage with up and over garage door accessible from the block paved driveway to the front of the property. Situated to the front of the property is this good sized double bedroom, having the benefit of it's own ensuite shower room. Fitted with a shower, W.C., and large oval shaped hand wash basin, with a heated chrome towel rail and tiled walls to mid-height and within the shower area. Another double bedroom also positioned to the front of the property. A particularly spacious master suite with French doors opening onto a Juliet style balcony, offering far-reaching views towards Sandal Castle. This room shares a Jack and Jill ensuite shower room with the adjoining bedroom five. This room has potential to be converted into a studio style granny flat if required, which would suit an independent teenager or for multi generational living. This bedroom is currently used as a dressing room/reception area to bedroom five, a buyer may wish to use this as one large master suite by keeping the two rooms adjoined via double doors (as it is at present), or they may wish to seal off the rooms and use separately depending on a buyers needs. Another large double bedroom with a Juliet balcony offering the aforementioned views. This bedroom has it's own entrance door from the landing, or can be accessed through bedroom four as previously mentioned. Bedroom five also benefits from the Jack and Jill ensuite shower room. The Jack and Jill ensuite shower room is fitted with a corner shower, W.C. And hand wash basin. The shower area is tiled in white. The family bathroom is fitted with a luxury freestanding bath tub, separate shower, hand wash basin and W.C. Finished with travertine tiled floor and feature wall and white tiling to the remaining walls. A staircase has been built to allow access to the attic space, the loft is mainly boarded and does have great potential for conversion (which was the current vendors plans to create a sixth bedroom) however this would be a project for a buyer to finish and would be subject to the relevant consents. Externally the property has a lawn area to the front and block paved driveway offering parking for one car and leading to the garage. Extended parking space could be created within the front garden space if desired. To the rear of the property is a good sized split-level enclosed garden, mainly laid to lawn and bordered with mature shrubs and hedging.